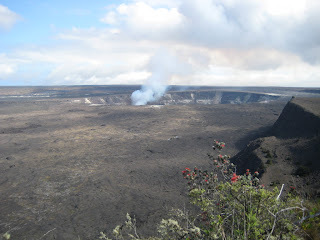 We got up early on our 5th day on Big Island, checked out of our resort, and hit the road. 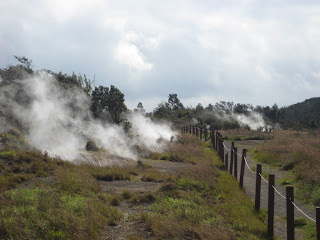 We decided to drive around the south side of the island and see some sites before checking in at the bed and breakfast place near the town of Volcano we would be staying that night. Down around the southern most point of the island we stopped at a bakery called Panaluu, which is the southernmost bakery in the USA. Since it was lunch time we decided to eat there. They had a nice little place outside where people can sit and eat. After lunch we wandered about looking at all the different types of flowers that grew nearby. We got back on the road and started heading east along route 11. There was lots more beautiful scenery to see. We stopped at one place that was very beautiful, and Jackie had to yell, "漂亮!" (piào liang... beautiful) since it was so lovely. It was the only time I heard her speak Chinese during the whole trip. The picture here does not show how vivid the colors really were. 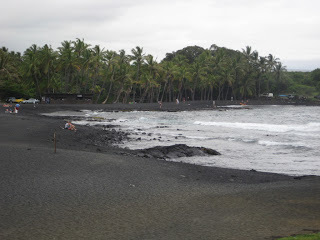 We also visited a black sand beach that was very pretty. 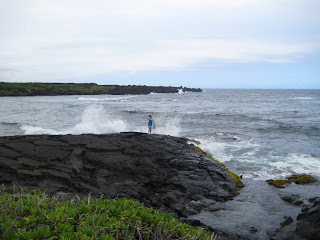 The thing that struck me about the black sand beach was how strong the waves and wind were. It was exhilarating being there. Eventually we made it to the Volcano Forest Inn, which is where we stayed that night. The Volcano Forest Inn is a really nice B&B place run by a couple named Debbie and Greg. They did a very good job of making us feel welcome. The inn is located off of route 11 about a mile or two from the Volcano National Park, down a little gravel road and surrounded by jungle (rain forest is the new pc term for it, but I still call it jungle). We went back to the Volcano Forest Inn before dusk, and met another couple that were staying at the inn also... John and Teryn (hope I spelled that right) who were from Oregon, and friends of Debbie and Greg's. Everyone else had already had dinner; so Jackie and I heated up our leftover pizza, lasagna, and Pasta Milano and had a nice Italian dinner. After the sun went down there was a light rain and everyone headed out to the park to see the lava at night, but Jackie and I were a bit tired after all the driving around that day so we stayed at the inn and relaxed before going to bed. 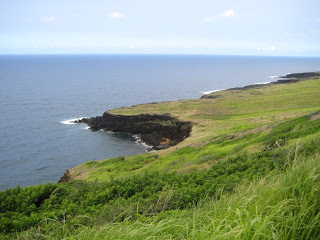 We wanted to get up early the next day to see some sights on the east side of the island before our afternoon flight to Oahu. The adventures of a decadent western capitalist American living and working in the People's Republic of China. Legal Stuff: The postings on this site are my own and don't necessarily represent IBM's positions, strategies or opinions.